Add New York to the list of states that are allowing testing of self-driving cars on its roads. Gov. Andrew Cuomo said the state is now accepting applications from companie wanting to mix it up with human drivers on New York streets and roadways, some of the most congested in the nation. "New York has emerged as one of the nation's leading hubs for innovation, and as we invite companies and entrepreneurs to reimagine transportation technology, we will encourage the development of new, safe travel options for New Yorkers," Cuomo said. "With this action, we are taking a careful yet balanced approach to incorporating autonomous vehicles on our roads to reduce dangerous driving habits, decrease the number of accidents and save lives on New York roadways." The state legislature recently authorized a one-year pilot program, joining 13 states and the District of Columbia in trying to get in on the development of autonomous vehicles. New York is accepting applications from companies interested in testing the vehicles through a year-long pilot program. But it's not giving companies quite as much of a free hand as some other states. For examples, each company will need to have a $5 million insurance policy, will have to submit regular reports to the state and will have to pay the state police for supervising each test. The locations of tests will also be tightly regulated. Testing also cannot take place in construction or school zones and must adhere to a predesignated route shared in advance with the state. "While we all are familiar with the idea that self-driving cars will one day likely be commonplace, the reality is that there is a long road ahead before we get there," said state DMV Deputy Commissioner Terri Egan. "We need to make sure these vehicles are safely tested on our roads, while providing opportunities for the public to become familiar with this technology. This is a balanced approach consistent with New York’s long track record of highway safety as well as innovation." 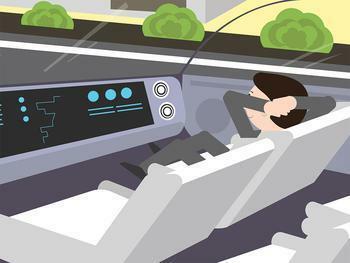 Besides the state action, New York City is participating in a federal program to design "connected car" technology, which many analysts think will be supplanted by the more independent systems being developed by Google, Apple, Tesla, Uber, and other technology companies. The NYC program includes special traffic lights that can connect to vehicles wirelessly. What's behind the push for autonomous cars?